In a previous blog, I noted society’s uneasy relationship between material things and the sacred in places of cultural and historical interest. The outrage over the Ten Commandments monument at the Oklahoma State Capitol was only topped by The Satanic Temple’s planned satanic statue right next to it. Egyptian Salafists depicted the Giza pyramids as idolatrous symbols of paganism and called for their destruction. American atheists filed a lawsuit to prevent the Ground Zero cross – made from steel beams found in the debris of the World Trade Center – from being displayed in the 9/11 museum, calling it a religious symbol and not a piece of history. These controversies remind us that material things in religion have not gone away and have to be taken seriously. They are inconstant renegotiation and remediation, and new religiosity in the digital space creates a unique opportunity to revisit this debate. How can the transcendental or spiritual be made tangible to a virtual audience, especially when religion is taken out of its physical space of the mosque, church, synagogue, etc.? How is materiality regulated in online religious activism? In my posts on online Salafist movements, I pointed out a very contemporary religious rhetoric of inward belief and purity, captured in calls to a strict monotheism (tawheed) and warnings against any human innovations in Islam (bid’ah). The YouTube channel Salafimedia UK, for instance, projects Islam mainly through video khutbahs (sermons) where they quote the Qur’an as the only legitimate guidance for Muslims and speak of eternal punishment for those who associate with any things Western. In contrast, SLF Magazine (which I posted about here) is mainly concerned with regulating material, political, and aesthetic aspects of Salafism, utilizing comics, popular culture, and Salafist fashion. The individual blogs create humorous imagery of future Muslims going to the mosque in a flying saucer; of “Super Muslims,” “Iron Muslims,” or simply “superheroes of modern times” stopping endless fighting in foreign lands, such as in Syria; of “cyber-jihadists” hacking websites of powerful Western and Israeli establishments; or of “fashion icons” popularizing Salafist fashion trends, such as the sirwal (baggy pants) and dense beards whose style was recently borrowed by some Hollywood actors. But creativity doesn’t stop here. A major way of how some new online Salafist movements use religious things is through satire. 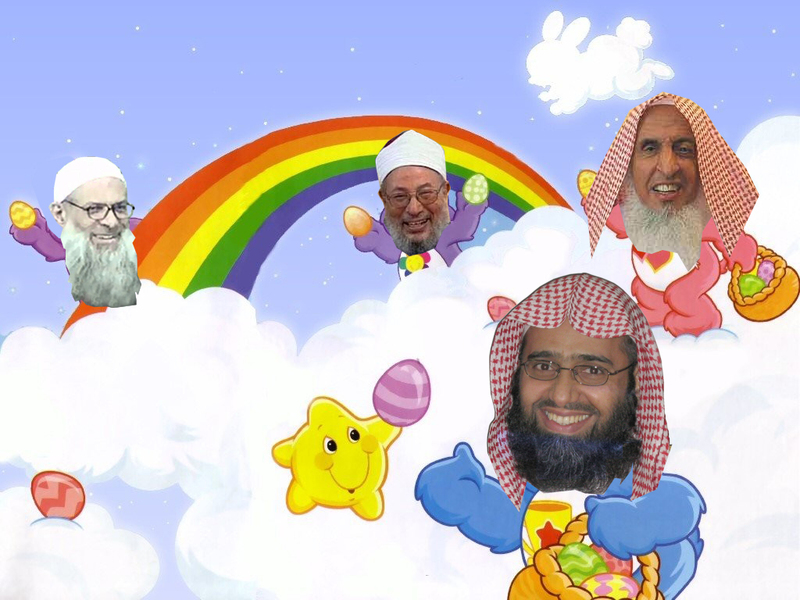 In the picture to the right, SLF Magazine ridicules Muslim leaders in Saudi Arabia and Egypt by superimposing their heads onto the bodies of Care Bears – multi-colored plush teddy bears radiating love and collecting Easter eggs. You see in the front Abd Al-Aziz Fawzan Al-Fawzan, a Saudi Arabian author and professor of Islamic law. Behind him is Sheikh Abdul Aziz bin Abdullah, the Grand Mufti of Saudi Arabia, as well as the Egyptian sheikhs Yusuf Al-Qaradawi and Mohamad Said Raslan. The embodiment of caring – Care Bears – is mapped onto imams that are often seen as hardline Islamists to provide fierce criticism of their apparent inactivity or inability in helping the Salafist cause and their sell-out to the West. 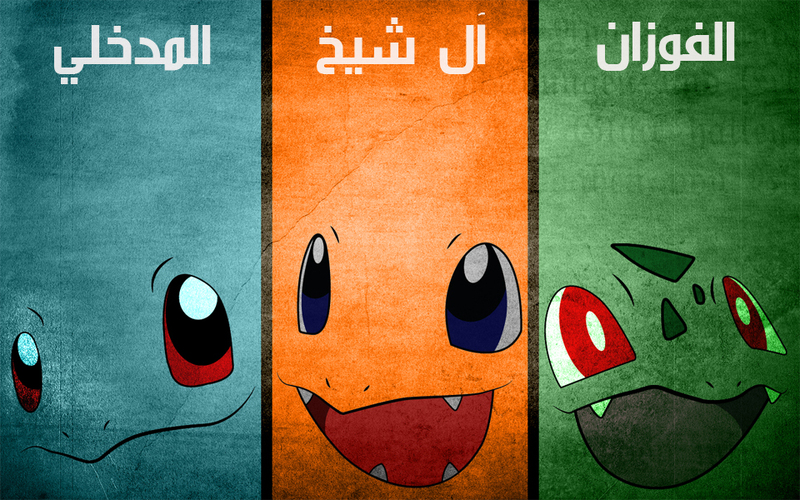 The blog continues to use female, Western, and children’s imagery, calling these imams Pokimams (a blending of Pokemon and imam, see image on the left) and likening their Islamic practice to an Islam in the world of Barbie; a toothless Islam with hearts and butterflies; a Coco Chanel No. 5 Islam; a soft, gentle, peaceful, hippy, zen, and Sufi Islam; an Angelina Jolie, Mother Theresa and Mahatma Gandhi Islam, and an Islam that is like Thanks Giving, Christmas, Hanukkah and Yom Kippur. He contrasts these images to the Islam the magazine wants to popularize: an Islam with prayer, the Quran, the Sunnah, Sharia, hizba (enjoining good and forbidding evil), and the obligation of jihad. Pokimams, in the magazine’s view are puppets of Arab governments who mislead masses of ignorant Muslims and are subject to their respective owners – the Saudis and Americans. These accusations also surface in Salafimedia UK’s depiction of Saudi Arabia’s King Abdullah as a dog and as “King Abdullah bin Obama Al Amriki” (King Abdullah of Obama the American) with the title “Custodian of the Holy White House and its Allies. Portraying the king as a dog is crucial in adding to the insult since dogs are often seen the manifestation of the impure in Islam. These digital spaces where seemingly everything goes and kings are portrayed as dogs remind of what Mikhail Bakhtin calls the carnivalesque in his 1965 book Rabelais and His World. Bakhtin viewed the annual celebrations of the carnival as a celebration of folk culture and an opposition to the dominant medieval feudal culture. It was filled with people dressing up and laughter while mocking anything that was official or authoritative, especially the king and the church. Of course, in our society the carnival does not have the same ring as back in 16th Century Europe. But the carnivalesque as an analytical concept that challenges a threatening dominant power through material things, humor, and mockery has remained influential, especially in some scholarly work of children’s literature and popular culture. The carnivalesque creates a space where all “rules, inhibitions, restrictions and regulations, which determine the course of everyday life, are suspended, and especially all forms of hierarchy in society,” Bakthin states. Characteristic is a role reversal in which the king becomes the fool and vice versa. Through satire and material things, the Salafists defeat the social and religious rules established in centuries of Islamic jurisprudence. Natural rules of the body are also suspended and stretched into the grotesque. The imams’ oversized heads are superimposed onto smaller Care Bear bodies and Pokemon oversized eyes represent the whole of the Imams. The grotesque body, Bakhtin notes, departs from both classical and modern ideals of beauty’s well-defined proportionality and a harmonious whole. It is defined by protrusion and distortion — a strategy also used in some popular sitcoms, such as Comedy Central’s South Park, which is known for its dark, surreal humor that satires many controversial topics. The body must expand beyond its natural limit to subvert idealized norms, which also has a timeless and de-humanized element: the imams are eternally trapped in Care Bear and canine bodies. 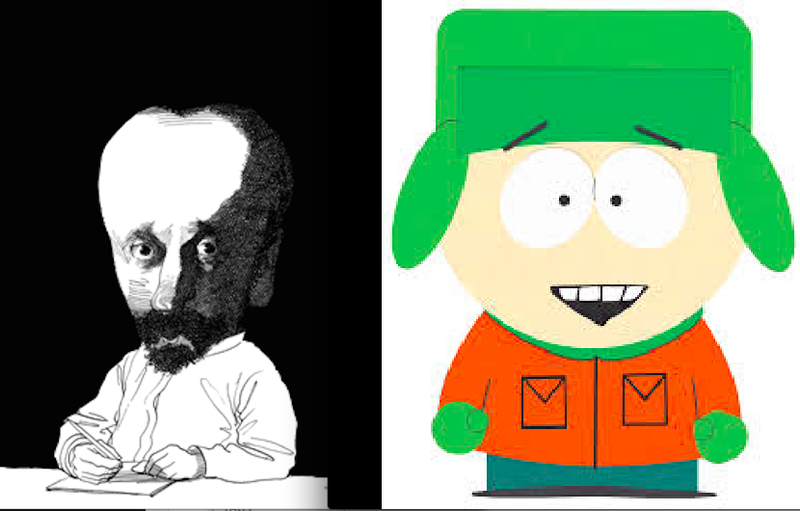 They do not evolve, similar to how South Park’s four nine-year old boys do not grow out of their pre-adolescent bodies and mature into adults. So, can Bakhtin’s ideas on the carnivalesque and the grotesque be useful for conceptualizing how material things in religion create meaning in digital spaces? Perhaps. Bakhtin proposes that the carnival was not confined to the physical space of the town square or the adjacent streets, but penetrated the house and minds of people. All participants embodied and symbolized the carnivalesque idea of belonging to all people. Dialogic voices replaced the single monologic voice of the dominant power. Furthermore, all aspects of the carnivalesque are in the interest of making something new, even the grotesque. “To degrade is to bury,” Bakhtin writes, “to sow, and to kill simultaneously, in order to bring forth something more and better.” One could be anything or dress up as anything and not be bound by limits, tearing down old forms and creating new ones. Spaces of rebirth and renewal emerge: all that is normally separated merges together, may they be the profane and the sacred, Islamic religious authorities and commercialized Western brands, or dogs and kings, together creating a modern and public Salafism.